Yor room is nice. I like the all bookshelf matched approach. Looks like you've got absorbtion covered as well. Good stuff! Got any black zip ties to sort out those speaker cables? Cheap cable management. Great room you should be proud of! That's a very nice room!! How do you like the screen up that high? Do you feel like you are looking up all the time? Thanks Fred! I sit far enough back to keep a relatively level head but maybe my eyes are slightly looking up, nothing strenuous. I know it should be on eye level but it was a compromise between HT and music. I wanted the tweeters on ear level and since I don't want to use a center channel ( same speaker for all channels is the way to go IMHO) meant the screen had to be bumped up. Cool, thanks. The general recommendation for the bottom of larger screens seems to be about 18" from the ground. I have a receptical on the wall at 24" and for 2.35:1 the bottom of the image is at around 3 feet. In the first couple of tests it feld a little awkward looking up like that, but maybe I'll get used to it. I'm guessing those are difuser panels behind the three speakers. Where did you get them? They look quite nice. I made the panels myself. The material I bought in 1X1 squares and glued them to backboard then mounted to the wall. Very easy to do. The material was from a local store here in Calgary that was closing down and sold it for cheap. Looks good and nice to see another Calgarian on the forum. If you really want your room to start to sing, ditch the foam panels and make some DIY custom printed acoustical panels using acoustical insulation (OC703 or some of the many cheaper alternatives). Foam really doesn't lock down much more than the highs, but I bet you still got a nice positive benefit from them vs. the bare walls. If you ever go that direction, let me know. 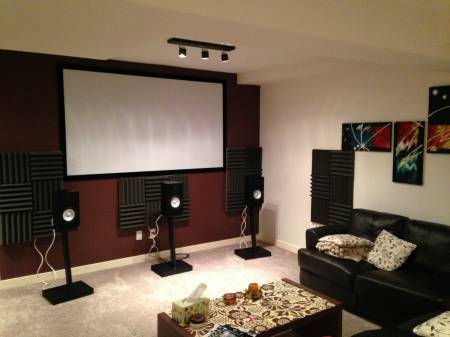 There is a thread over at "another forum" that I have been a leader of for some time with custom printed acoustical panels for cheap. Hey Nick. I'd actually be interested. I'm probably going to need something for the wall behind my couch to reduce light reflections and do a bit of sound damping. I doesn't sound too bad as is, but if I need to put something up for light, might as well kill two birds with one stone.